I kinda vanished, didn't I? Sorry about that. Antibiotics are endlessly un-fun. At least it's not the flu this year! Because the pills were every six hours, I didn't sleep too well while I was on them. They're done and I'm starting to feel better, but I haven't caught up on the missed sleep yet. Sorry if this is a bit 'Hey look...a thing! ', but...hey look...a thing! 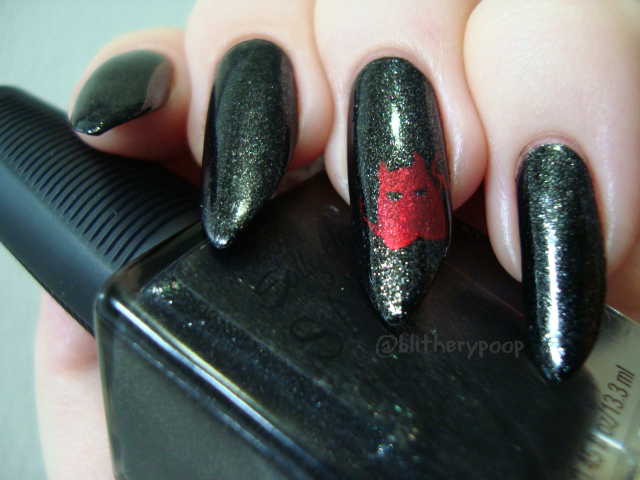 I had an idea for some nail art using this adorable little demon from Bundle Monster's BM-305 plate, but it kinda didn't happen. Instead I wound up just stamping it with Sally Hansen Red-io Active over Sally Hansen Raven's Wing. I bought the plate entirely for this image, I love it that much! I didn't even stamp yet when that set came out, but this little guy made me really want to learn. You'll probably see him again next year with more...pizzazz. Mere hours are left in Wicked Winnings #4! If you like weird lipstick, scurry!